Free from the protection God gives to those who are faithful to him. Free from the shield God places over those who are walking closely with him. Free from the hand of God which guards the path of those who listen to him and obey. 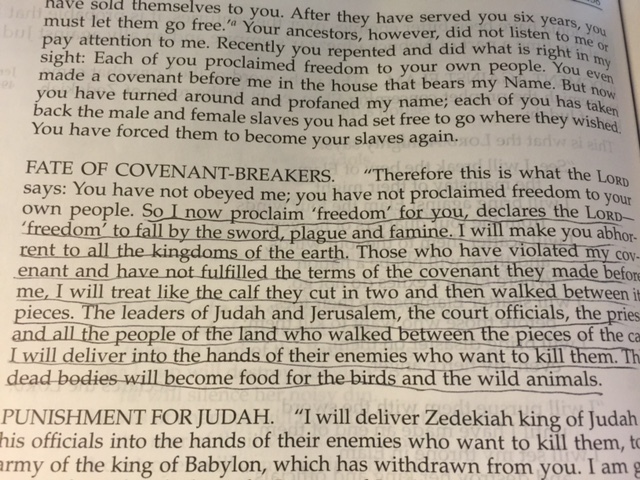 The Hebrews had made a promise to God to let go of their fellow Hebrews who had become slaves. But then they changed their minds and took their slaves back. They probably realized when they started to do all of the work themselves that this deal wasn’t going to be as easy as it sounded. When it became inconvenient, they decided it was too much, too hard, not something they wanted to do. So they ignored the promise they made to God. Do we ever make a promise to God….and then change our minds? When the going gets tough, we decide we really aren’t going to do what we told God we would do? Now that the crisis is over, it just doesn’t seem important. Or any number of other excuses we give ourselves for backing out of our committment to God. And we step out from under the umbrella of God’s protection and blessings when we do this. Then we experience the pain of the consequences of these decisions. God has given us freedom of choice. As a result, we are ‘free’ to make some very bad decisions. We know the way, we just have to use our freedom of choice to choose it.